Discover your charming villa with 4 bedrooms in its luxuriant planted tropical garden of palm, coconut, frangipani and traveler’s trees. This 3 bedroom villa is ideal for small groups or families. 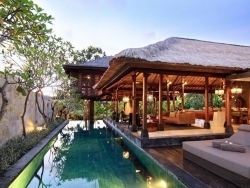 Built on a single level, this Bali villa is tastefully decorated with its own 15m private lap pool, landscaped gardens, a sunken lounge and zen area with a swing. The villa is a beautiful three‐bedroom villa, hidden behind a lush tropical natural garden and uses a combination of the finest styles of Indonesian architecture.